No less a figure than Connie Mack saw Elmer Myers as a true phenom, someone he thought could become “one of the greatest pitchers of a decade.” Suffering a German poison-gas attack in the First World War may have cost Myers his chance for greatness. Elmer Glenn Myers was born about 15 miles north of Gettysburg in York Springs, Pennsylvania, on March 2, 1894. He went through the York Springs public schools for eight years, then attended Perkiomen Seminary, a college prep school, for one year. He was of American-Dutch descent and seems to have lost his father at a young age. The 1900 census shows Barbara Myers as head of the family in York Springs, her two oldest sons John and George both working as blacksmiths. Three daughters followed in age, and then Elmer as the youngest. By 1910 Elmer was already doing day work as a laborer at age 16. A couple of years later – sometime in the fall of 1912 – he came to Connie Mack’s attention and was signed to the Philadelphia Athletics. In the spring of 1913 Mack had Myers assigned to the Raleigh Capitals in the Class D North Carolina State League, a club managed by his son Earle Mack. Myers handled a heavy load from the start – 308 innings. He won 17 games and lost 16. In 1914 at Raleigh he was 19-19 with 319 innings of work and a no-hitter against Winston-Salem. Myers joined the Athletics for spring training in 1915, but it was decided to have him spend one more year with Raleigh. He responded big-time, winning 29 games against 10 losses in 343 innings. He led the league in wins and in strikeouts with 268, but even with all those wins, the Capitals only finished third in the six-team league. 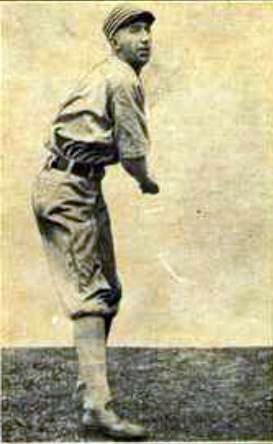 Myers had his first look at major-league ball on the last day of the 1915 season, pitching in the second game of a doubleheader against the Washington Senators on October 6. It was a 4-0 complete-game shutout, a two-hitter with a single in the first and a scratch single in the third. He walked five and struck out 12. Myers started off 1916 well, 6-1 in his first seven decisions, but he was pitching for a last-place team and by July 1 was 8-8, at season’s end 14-23 despite a better than team average 3.66 earned-run average. His 14 wins were just one behind team leader Bullet Joe Bush’s 15, and Bush lost 24, sparing Myers being last. This was a disastrous year for the Athletics –a record of 36-117. Between them, Myers and Bush had 29 of the team’s 36 wins. The once-proud Athletics team had won the pennant in four of the preceding five seasons. From 1915 through 1921, as Mack sold off his best players, they finished in eighth place every year. Mack expressed his belief in Myers in a June 7, 1916, comment to the Philadelphia Inquirer: “I consider this young player one of the greatest pitchers developed in many years, and he is going to make history – mark my word.” In one six-day stretch, from May 8 through the 13th, Myers defeated Walter Johnson 4-2, Jean Dubuc of the Tigers 3-2, and Dave Davenport of the Browns 4-3. On the 18th, he beat Red Faber of the White Sox. But it’s hard to win too many games for a team with a .235 winning percentage. Influenza felled Myers at the start of 1917, but he still got into 38 games, with a 9-16 record (4.42 ERA) that almost precisely mirrored the team’s .359 winning percentage. He began 1918 4-8 but was drafted into the US Army. Myers was 6-feet-2 or an inch taller, and listed at 185 pounds. He added a somber note, telling of having come across a dying soldier against whom he’d played semipro baseball, outfielder Ira Lady, who was an infantry lieutenant Myers found in a field near Verdun. He had a large part of his left thigh shot away, had been gassed, and died after Myers got him to a field hospital. Working in the trenches later on, Myers suffered a worse gas attack and spent several weeks in hospitals, both in France and then after he’d been returned to the US. While he was still in France, a March 1 trade in 1919 sent Myers, Larry Gardner, and Charlie Jameson to the Cleveland Indians for Braggo Roth. Myers was discharged in June and reported to the Indians. He lost his first home start, 1-0 to the Yankees, the run coming on two seventh-inning errors. After dropping to 0-3, he won three in a row, then kind of bounced back and forth, winding up 8-7 on the season with a 3.74 ERA. A year later, at the end of July 1920, with a record of 2-4 and a 4.77 ERA, Cleveland put Myers on waivers and he was selected by the Boston Red Sox. All of a sudden, it was as if he’d been given a new lease on life. The Red Sox finished 1920 in fifth place with a 72-81 record, and the Indians won the pennant. But for Boston, Myers was 9-1 with a team-leading 2.13 ERA. He lost the first game he pitched for the Red Sox, then reeled off nine wins in a row. The ninth came on September 23, and his bases-clearing triple scored three of Boston’s nine runs in the 9-2 victory. He led the league in denying home runs; in the 168? innings he pitched in 1920, he allowed just two home runs, one for the Indians and one for the Red Sox. His combined ERA was 3.25. The Red Sox didn’t see the same magic from Myers in 1921. He won his first two games, but losing all five games he pitched in July hurt him and he finished the season 8-12 and his earned-run average more than doubled, to 4.87. Things got even worse in the three games Myers pitched in April 1922. He lost one, his only start, then threw an inning of relief in each of two more games, but his ERA was 17.27 and the Red Sox cut him loose, releasing him to the Salt Lake City club of the Pacific Coast League on May 17. Myers played the rest of 1922 and all of 1923 for the Salt Lake City Bees, going 13-17 (4.24) and 11-16 (6.04) respectively. After a February 20 trade, he pitched in 1924 for Los Angeles, also in the PCL (15-17, 4.60). Why had Myers seemed to lose his effectiveness in Boston after being so successful when he first arrived there? It may have been that the physical effects of the poison gas attack in 1918 had caught up with him. He’d lost weight, and was dubbed “Slim” by the time of his release from the Red Sox.2 Nearly 20 years later he gave his take on it. “The effects of the gas were not noticeable immediately after I returned to baseball. However, I continually lost weight and tired greatly when I pitched nine or more innings. I needed more rest to recover my strength between games than I did before the war. I visited specialists and they told me pitching was too strenuous for a man in my condition and said I would have to quit the game. Despite the doctor’s orders, I kept on pitching. Each game my strength ebbed a little more. Then my fast ball began to lose its zip and I knew my big league days were numbered. However, I had a family to support, and I refused to stop. After leaving the majors, I got by for seven years in the minors before I finally gave up.”3 Once 185 pounds, he was later listed with a playing weight of 160. Myers’s 1925 season was a short one, also for Los Angeles, just 23 innings (1-0), likely due to injury. In 1926 he fully rebounded, albeit in Class B baseball for the Knoxville Smokies, where he put together back-to-back 20-win seasons: 26-11 in 1926 (3.66 ERA) and 23-11 in 1927 (with a 3.17 ERA.) His final two years in baseball were with Columbus of the American Association, a 10-14 season in 1928 and then a terrible 1-12 record in 1929. Myers did indeed have a family. He had married Gladys Griffiths in March 1918 and they had two daughters, Georgia and Barbara. He took up a position working outdoors with a pork-packing company in New Jersey. But driving a truck around the area to sell pork took a toll on him and he and Gladys opened a cigar and confectionery store in Atlantic City. He died of a stroke on July 29, 1976, in Collingswood, New Jersey. In addition to the sources noted in this biography, the author also accessed Myers’ player file from the National Baseball Hall of Fame, the Encyclopedia of Minor League Baseball, Retrosheet.org, and Baseball-Reference.com. 1 The Sporting News, December 19, 1940. 2 Boston Globe, May 18, 1922. 3 The Sporting News, December 19, 1940.